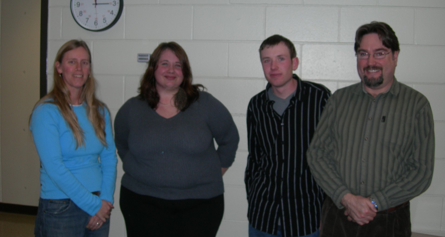 On December 10, 2009 Brandi Prouten and Braden Wolfe presented their Environmental Science Topics (ES 499) projects. Brandi Prouten’s project was: ‘Identification and Assessment of Possible IMPARA Sites in Manitoba’. The project focussed on conservation of reptiles and amphibians in Manitoba, and was supervised by Dr Pamela Rutherford (Biology). 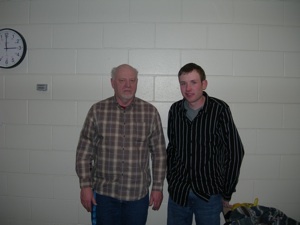 Braden Wolfe’s project was: Inter-row tillage/and mowing for small grain organic crop production and was supervised by Dr Byron Irvine (Brandon Research Centre – shown below with Braden Wolfe) and Dr Greenwood (Environmental Science Coordinator).